When I was travelling recently, I decided to browse the Sky Mall catalogue in the plane. Man, is that chock full of stuff we don’t need, far more seriously so (and at much higher prices) than the catalogues I’d found junk in the last time. Let’s look at some of the silliest, complete with scans from the catalogue. Click on each small image for a larger, readable one. 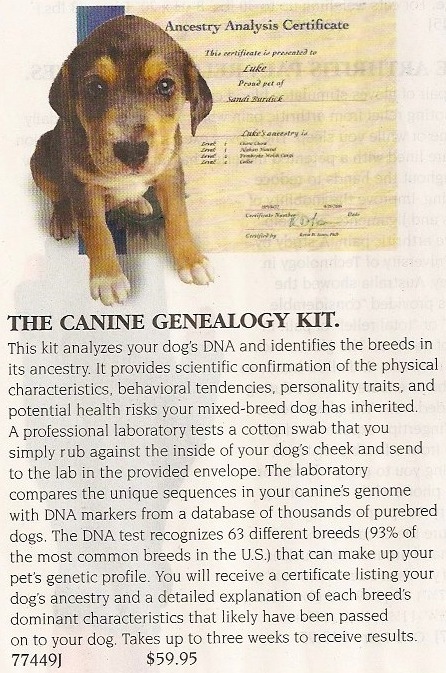 For $60 you can get your dog a DNA test. I really don’t know how much I can say about this, other than to note that they think a photo of a cute dog can sell pretty much anything. Well, and that it’s hard to think of a sillier way to waste $60. I’ll first note that this is labelled for ages 6 and up. 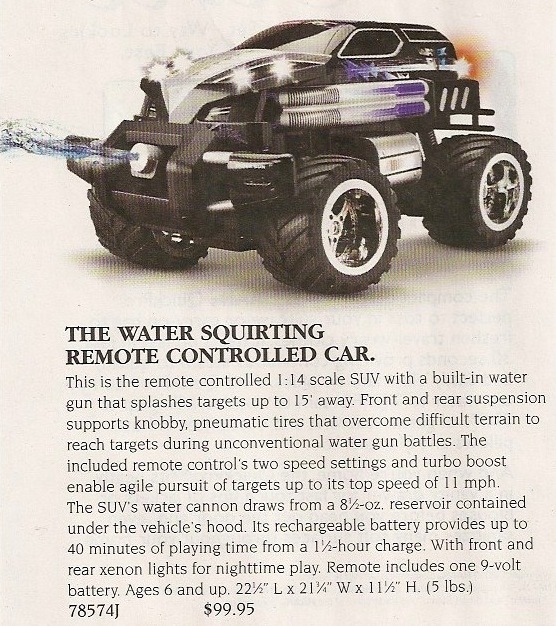 Now, imagine buying your 6-year-old a $100 toy that drives around the house at up to 11 miles an hour in agile pursuit of targets , and that squirts water up to 15 feet. You hope it’s water in there, anyway. Trust me: when I was six, you would not have wanted me to get my hands on one of these. Really. 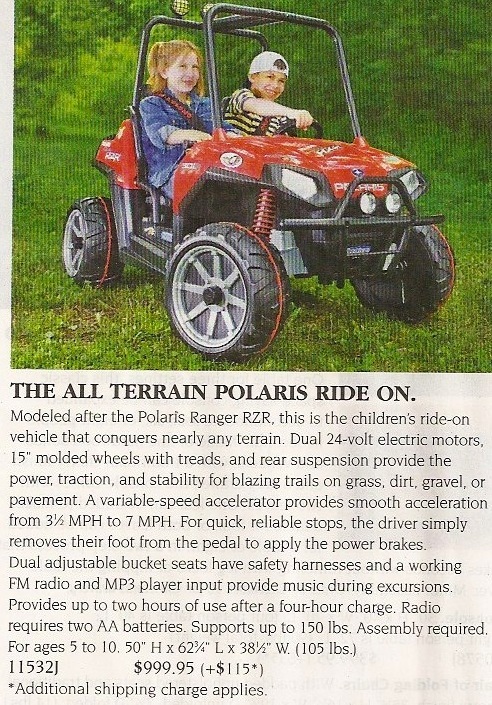 While we’re on too-expensive toys for six-year-olds, let’s have a look at this electric buggy, complete with radio. In and of itself, there’s nothing to complain about here — a nice little ride-on toy for the kiddies. For ages 5 to 10. Cool. But then we look at the price: $1,115, including the shipping. 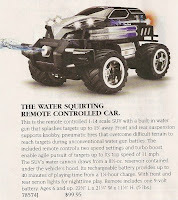 OK, I think a thousand dollars is a bit steep for a toy for a six-year old, don’t you? When I was a lad — and now that I’m not, as well, come to think of it — I made iced tea by putting tea bags in a pitcher and pouring in hot water. That seemed easy enough, and it never occurred to me that one might need a gadget for it. 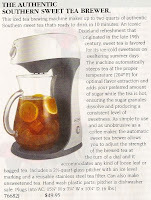 It occurred to the Hammacher Schlemmer people, though, and this is the result: for $50, you get get a thing that mixes the hot water and the tea and the sugar for you. 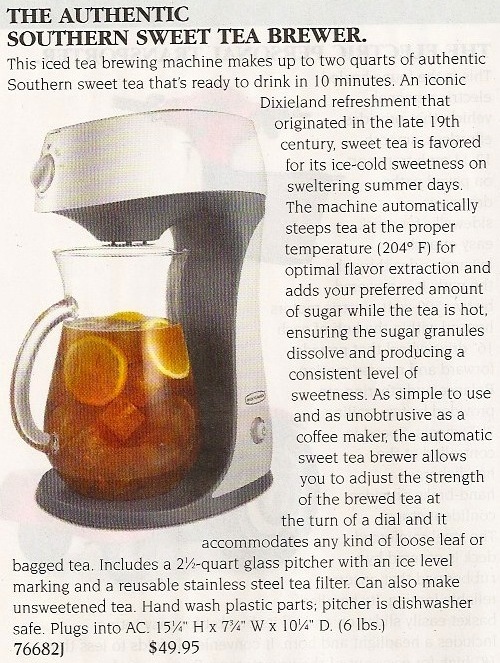 And, in case you had any doubt, it can also make unsweetened tea. This doo-dad looks like a pen holder, but is really a surveillance device (wink-wink). 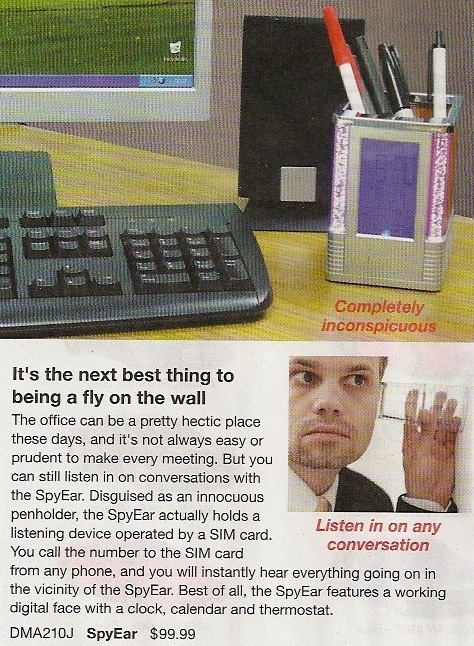 Specifically, it’s a cell phone that will silently receive calls and let you listen to whatever it can hear. Isn’t modern technology wonderful? But the part that I like is this: Best of all, the SpyEar features a working digital face with a clock, calendar, and thermostat. I presume they mean thermometer , but, really, it’s a clandestine surveillance device, but best of all it’s also a digital clock. Ooookay, fine. Finally, we have these things, for folks that have all their taste in their mouths. A friend and I can’t figure out which is more hideous. 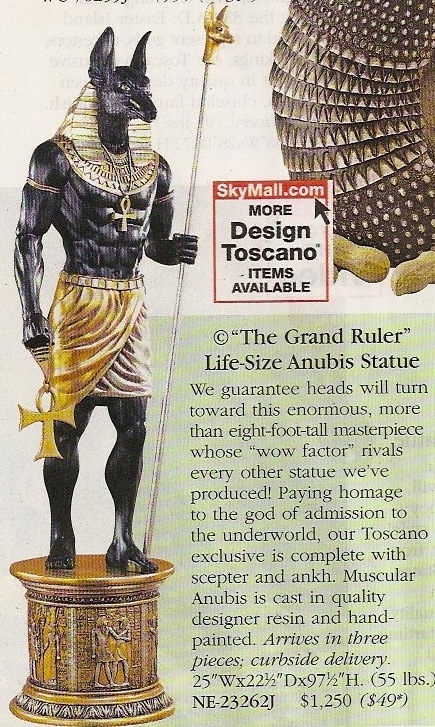 I say it’s The Grand Ruler Life-Size Anubis Statue, for $1300 including shipping. 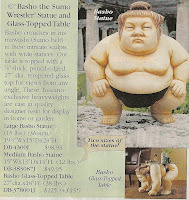 My friend goes for the Basho the Sumo Wrestler Glass-Topped Table, only $260. Just from a price perspective, it’s hard to beat the Anubis monstrosity. But, hey: would you have either one in your living room? Which has your vote for the worse of the two? I'm convinced that the people who make Sky Mall know the content is ridiculous and, in fact, have intentionally designed it that way so as to be entertaining on long flights. I think you meant "worst of the two", but in any case I would give them an equal rating. As for the doggy DNA test, I know several people who have had this done for one reason or another, although the results usually seem to be rather non-specific. I like to browse these kinds of magazine occasionally when they show up in the mail, mainly for the incredulity factor: I simply can't imagine anyone ever actually buying this stuff. It's a source of amazement that these things sell at all, but I guess they must, since someone makes them and is presumably making money. Well, no. I wouldn't pick on anyone else's use of "worst of the two", but I consider "worse" to be comparative and "worst" superlative. So in comparing two things, I use "better" and "worse", and I reserve "best" and "worst" for comparing more than two things (or an indeterminate number).